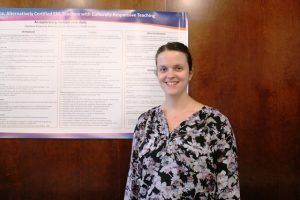 Students in the Literacy, Language, and Learning (LLL) and Contemporary Learning and Interdisciplinary Research (CLAIR) doctoral programs met for an evening to present their research to faculty, staff, and colleagues. Participants discussed research topics, methods, results and offered feedback and advice. CLAIR Cohort 3 student Amanda Moody Maestranzi presented her capstone project, which serves as the basis for her dissertation, on training novice teachers in cultural competence for English as a new language (ENL) instruction. CLAIR Cohort 5 students Larry Tung and Rinat Levy-Cohen presented “Self-Regulated Learning and Motivation: How Do Struggling Readers Perceive Themselves as Learners and Their Teacher’s Practices?” The research focuses on students’ under- or overestimating their abilities as readers and how they respond to the Read-Write-Reflect (RWR) intervention. 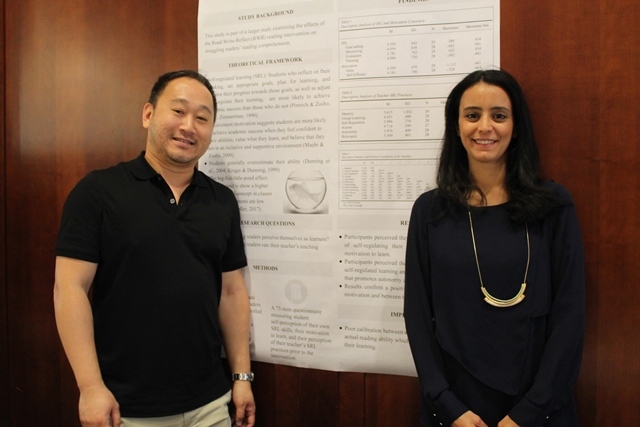 Larry and Rinat were part of a larger group focusing of the RWR intervention. “Self-Regulated Learning and Motivation: How Do Struggling Readers Perceive Themselves as Learners and Their Teacher’s Practices? How Do Artists Perceive Their Practice While Teaching Students of Color?